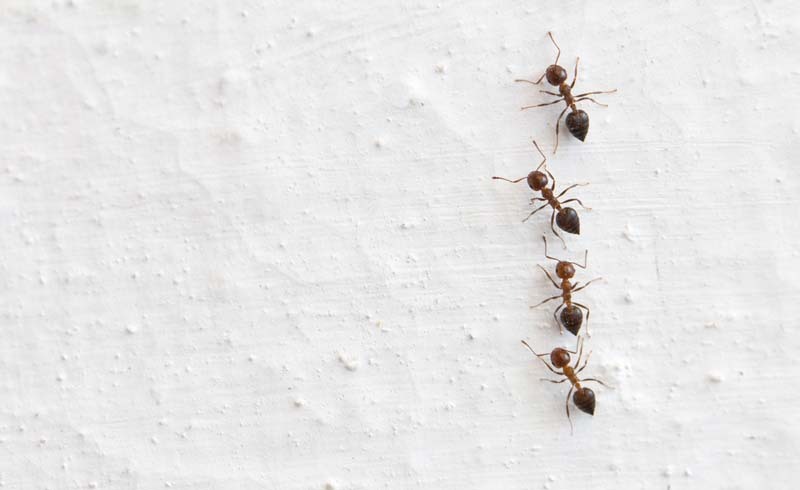 Shoo the six-legged squatters in your kitchen with these proven ant removal techniques. Q: I squashed an ant on my kitchen countertop this morning only to spot more circling the sink. Where did all of these ants in my kitchen come from? More importantly, how do I get rid of them? A: House ants—commonly of the Little black, Pharaoh, Argentine, or Odorous house varieties—enter kitchens through cracks in windows, doorways, or floors in search of morsels that might replenish their own colony’s food and water supply. Killing one ant in the kitchen isn’t the solution: Where there’s one ant, there’s usually a colony nearby, and each ant leaves behind a trail of chemicals called pheromones that attract its species in the vicinity. Until you wipe out the ant colony where the egg-laying queen resides, she’ll continue to reproduce and send additional worker ants into your home to score free refreshments on your kitchen countertops and inside sinks and cabinets. Read on to learn how to get rid of kitchen ants permanently. Identify the entry point. Observe those ants in the kitchen for a few minutes to find out where they’re coming from—be it cracks in the kitchen floor, crumbled caulk along a windowsill, a torn window screen, or small holes inside of a kitchen cabinet mounted against an exterior wall. You’ll target the entry point in your ant removal efforts, so don’t seal it quite yet. Find the nest. Wait for the ants return to the source with their crumbs, and try to spy where they go after exiting the kitchen. Tracking their movement will sometimes lead you directly to the nest where the rest of the colony lives. The nest may be located outdoors (e.g., on the ground, in a tree) or indoors (e.g., in a moisture-damaged wall or cabinet void) and will typically resemble a mound of debris or a pile of decaying leaves. If you find the nest in an indoor structure, like a wall void, apply a very thin layer of boric acid powder (available on Amazon) directly over the nest using a plastic squeeze bottle to kill the ants inside. While fatal to ants, the white powder made of Boron and water is a low-toxicity product to humans. Store any leftover powder out of reach of children and pets. Then, use a vacuum with a hose attachment to remove the physical nest from the wall void, and discard the contents of the vacuum dust collector bag outdoors immediately. Reapply boric acid to the emptied space, and repair any damage to the wall with joint compound. Use traps to kill the colony. If you don’t find the ant nest or don’t want to destroy it yourself, kill the colony with a store-bought trap (such as Terro, which is made of borax) or a homemade ant trap consisting of a small, sealed plastic container filled with one teaspoon borax and a quarter-cup corn syrup. Position the trap as close as possible to their entry point to the kitchen so that the ants quickly find the bait. Once the worker ants enter, they will carry the poisonous bait inside the traps back to their colony to feed the queen and her young, in effect killing off the whole colony over a period of a few days. Remove all other food sources from the vicinity of the ant traps so that there are no distractions. Clear out remaining ants. After killing the colony, you might be left with a stray ant here and there on some kitchen surfaces. To kill these, sprinkle a scant amount of food-grade diatomaceous earth in the ants’ path to dehydrate and kill them. Alternatively, spray the ants with a soapy solution (one tablespoon dish soap and 12 ounces of plain water) to immobilize the ants, then wipe them away with a paper towel. Seal the entry point. Seal the entry point you identified earlier to prevent new ant colonies from invading your kitchen in the future. Caulk is an appropriate sealer for closing cracks around windows or doors, while joint compound is suitable for sealing small drywall voids. Call in the pros if you continue to see ants in the kitchen after using the techniques above. Certain types of ants, such as Carpenter ants, build satellite colonies that are separate from the parent colony where the egg-laying queen resides. What this means for you: Ants can reappear in the kitchen if a satellite colony was destroyed but the parent colony remains intact. A pest control specialist can help locate the parent colony and stamp out the ants for good. 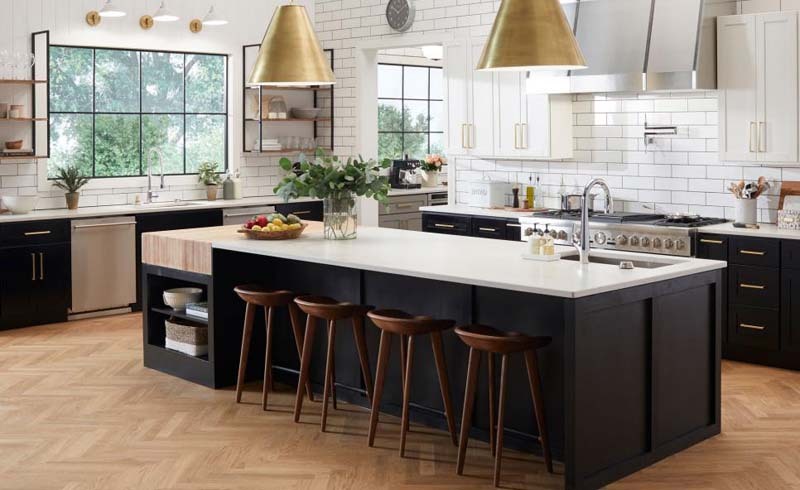 • Routinely wash kitchen countertops, floors, and cabinets with cleaners suited for the specific material. • To keep ants at bay, never leave uncovered food or drink on counters or floors (that includes pet food); always store leftover foods in airtight containers. Standing water is an invitation to ants to drink up, so wipe up water and other liquid spills as they occur and don’t leave pots and pans soaking in the sink for more than a few hours at a time. • Keep the lid on lidded garbage cans shut tightly when not in use, and take the trash out every one to three days. • Make your kitchen inhospitable to ants by coating previous ant entry points with homemade ant repellents such as two tablespoons of peppermint oil and a quart of water, equal parts apple cider vinegar and water, or a sprinkling of cinnamon powder. • Regularly inspect the kitchen for plumbing or appliance leaks and repair the leak and any moisture-damaged indoor structures to prevent the formation of indoor ant nests. • Trim tree branches that touch the siding of your home; if the tree harbors an ant nest, the branches can act as a bridge for ants to enter your home.